Considering the enormous curveball that was the long term injury to WWE World Heavyweight Champion Seth Rollins, the WWE have done a decent job of putting together this pay-per-view. The championship tournament, while reasonably predictable, still leaves us with a fan favorite match up of Kevin Owens versus Dean Ambrose and the high possibility of Roman Reigns versus Dean Ambrose for the first time ever. The mid-card, despite the fact that we still don’t actually know who will be partaking in the traditional 10 man Survivor Series match, looks rather interesting as well. It is worth noting that this is set to become the pay-per-view with the lowest number of title defenses in a very long time with Charlotte seemingly being the only person defending a title at the event. These predictions will be laid out in the order that the matches should take place in. Obviously, there hasn’t really been a feud here so instead let’s look at how they got to this stage of the tournament. Owens had a relatively simple run to the semi-finals. He was always going to beat Titus O’Neil and Neville. Ambrose had a trickier run to the tournament taking on the debuting Tyler Breeze in a very well booked match and following it up with another highly anticipated match with Dolph Ziggler. Both men are incredibly popular and it was great to see the two top babyfaces going at it. What Should Happen: Ambrose wins… just. 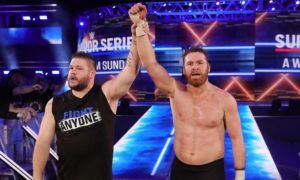 Before Seth’s injury, it looked like they were setting up an Intercontinental Championship match between these two for Survivor Series anyway and had the match been for the title, you’d think Owens would be the one winning, but given this is a tournament match, I think the best possible outcome here is Ambrose winning a long, 15+ minute match to put himself in the tournament final. What Will Happen: Ambrose wins. I’m going to play it safe here and back in Ambrose. Owens winning would be absolutely fine with me, but I think we all know that the WWE want to set up Ambrose versus Reigns for the final to make the match as big as possible so expect Ambrose to get the victory here. Del Rio’s run to the semi-finals was a rather lackluster one. His first round match with Stardust was so forgettable, I had to Google the tournament to remember who he actually faced and his quarter final match against Kalisto was average to begin with, but was marred by Del Rio (hopefully) accidentally unmasking Kalisto and having to awkwardly put the mask back on him. Reigns meanwhile had match number 434 with The Big Show which was Triple H punishing us for Reigns not accepting his offer and then an outstanding match with Cesaro. Cesaro certainly carried the match, but Reigns more than held his own and proved he can keep up with the best of them. What Should Happen: Reigns wins, duh. Del Rio simply doesn’t deserve to be in the finals of this tournament. The crowd has already returned to not caring about him, this MexAmerica gimmick is failing miserably and we know they won’t put the title on him which leads to an obvious final, even if Del Rio winning is unexpected. Reigns has to at the very least make the finals of this tournament from a storyline perspective and the smart thing to do here would be to have Del Rio injure the arm of Roman to have him sore going into the final. What Will Happen: Reigns wins. This is the most obvious match of the night to predict for all the reasons stated above. There is no way Reigns loses this match. With these two matches going on first, it gives both men ample time to prepare for the final with the maximum possible rest time. Hopefully they give us a backstage segment between Ambrose and Reigns before the match. Another match without feud that can be judged so instead let’s try and predict who will actually be participating in the match. Ryback and The Usos have been teaming up against The New Day a lot recently and on Smackdown The New Day attacked The Lucha Dragons after their match so it looks like the babyface team will probably be Ryback, The Usos and The Lucha Dragons, which means no Cesaro on the pay-per-view unfortunately. As far as the heels go, The New Day are virtual certainties and the most likely team mates for them would be Sheamus and Wade Barrett, but don’t rule out The Ascension being used either. What Should Happen: Babyfaces win, yay! Storyline wise, the best possible result here is the babyface team winning. Firstly, there’s no feud going on here so the win would simply be to keep the crowd happy. Secondly, the match should end with both The Usos as the only survivors which should set up a Tag Team Championship match against The New Day for the TLC pay-per-view. Predicting the elimination order: Sin Cara, Xavier Woods, Wade Barrett, Kalisto, Big E, Ryback, Sheamus, Kofi Kingston. If I predict all of that correctly, I’m going to buy a lotto ticket. What Will Happen: Team Face wins. I guess it’s hard to say what WILL happen considering we don’t even know who WILL be in the match, but this match basically serves as a piss break after the tournament matches so does it even really matter? This is a tough feud to judge because how much you enjoy it depends on how much you like WWE going down the supernatural path. I, personally, don’t enjoy it that much, but the way the druids were used and the general idea of Bray taking their powers was still interesting. The match will also be a hard one to book. I doubt they’ll have Braun Strowman looking weak and that means when The Brothers of Destruction win, it’ll be Bray that takes another pinfall lose and another shot at his credibility. What Should Happen: The future. From a brutal, long term perspective, it’s essential that The Wyatt Family win at Survivor Series. Surely Bray can’t suffer another big loss and remain a credible threat, considering he loses every feud he’s in. The long term accolades of defeating the Brothers of Destruction will do wonders for The Wyatt’s and Bray has already suffered a loss to Undertaker. It also sets up The Undertaker’s final match at Wrestlemania better. He should look mortal going into his final match so when he gets that one final win, it means that much more. What Will Happen: The Brothers of Destruction win. I’m not stupid though. The WWE are celebrating the 25th anniversary of The Undertaker, there’s no way they’ll have him lose. Considering this whole pay-per-view is focused on him, Kane taking the pinfall would also be a little strange, unless they lay the Wyatt’s out after the match which would also feel hollow. Expect The Brothers of Destruction to win clean and expect Taker to tombstone Bray for the win. This was the feud that probably suffered most from Seth Rollins’ injury. They lost a full fortnight of development because of the tournament and that set the feud back so far it was almost surprising to see the match announced for Survivor Series. Despite that, Ziggler is the perfect opponent for Breeze and the two should put on a stellar match if given enough time and this feud must continue to be about Breeze trying to prove he’s better than Ziggler and Ziggler trying to show the ‘kid’ that he needs to earn his respect. What Should Happen: Heel it up. The best outcome here is Breeze winning via some sort of heel-trickery. Given this should be the first of a few matches between the two, having Breeze win by pinning Dolph with his feet on the ropes or something like that is probably the best way to keep it going strong. Having Breeze win clean first up would probably be a little unrealistic with how good Dolph is and his spot on the roster, but Breeze should still have his hand raised at the end of the match. What Will Happen: Breeze Wins. Breeze winning is essential and I think the WWE are smart enough to know that. If Breeze not only loses his first match, but his first pay-per-view match, he’s destined to become Adam Rose 2.0 and someone as good as Breeze deserves much better. This is a guy who should one day be at the top of the card, but he must be booked strongly here and I think Breeze will walk away with a win, one way or another. Things certainly escalated quickly between Charlotte and Paige, in many ways. The feud was humming along and all of a sudden they’re thrust into the main-event of the final Raw before the pay-per-view. As awesome as it was to see a women’s main-event on the main roster, this feud wasn’t ready for it and didn’t have the material to work with. Because of that, they had to manufacture the heat and that lead to the comment Paige made about Charlotte’s dead brother. Normally I’d be okay with such a thing. This is pro-wrestling and she’s trying to make you hate her, if that’s what you feel, she’s doing her job, but unlike when CM Punk used this tactic against The Undertaker with Paul Bearer, they did not get the consent of Reid’s Fliehr’s parents who were shocked at the angle. Despite that, this feud still has the makings of being great, but it needs to be focused on the title and on who is the better wrestler rather than Charlotte’s family. Charlotte needs something other than her family in order to get her over with the crowd. Ok WWE, you want to generate the most interest in this women’s division possible? This is what you do. Capitalize on the heat that’s on Paige right now – put the title on her, clean. That’s right, Paige beats Charlotte with no assistance whatsoever. From there, you build up to rematches at TLC and the Royal Rumble, you build Charlotte up as someone who knows that Paige beat her and knows she needs to improve and prove she can beat Paige. That makes fans want to care about Charlotte and makes her seem like someone you can relate to than she has been presented in the past. The reason Charlotte was easily the least popular of the Four Horsewomen in NXT was because the crowd related to Becky Lynch’s story of sacrifice to get to the WWE, once she was able to tell it, everyone loves that Bayley was an innocent girl, happy to be where she is and everyone loves Sasha… because she’s Sasha… whereas Charlotte is the genetically superior daughter of Ric Flair, features that don’t make for a great babyface. Put the title on Paige, it’s unexpected and best for the division. What Will Happen: Charlotte wins. All things considered, the odds that Paige will be given the title are pretty slim. WWE are known for their lack of patience and they’ll want Charlotte to get revenge immediately rather than building it up. On top of that, they probably don’t want Charlotte to drop the title so quickly considering they’ll want her at the top of the division. Quick title changes aren’t a bad thing, especially since we’ve had two significantly long title reigns in the last three years. What Should Happen: Swerve us. They have a lot of options for what they should do, but only one for what they shouldn’t do and that’s either man winning clean. Reigns winning clean discredits him in the eyes of most of the fan base and kills his title reign before it’s even started. Ambrose winning clean, though surprising, is also not the way to go because it leaves Reigns in limbo and doesn’t set anything up passed Survivor Series. They could go down the route of following history and having Reigns selling out like his cousin did all those years ago or they could do the opposite and turn Ambrose heel, selling out to The Authority or simply cheating to become the champion. Ambrose turning heel seems the most unlikely given how popular he is and given there’s no chance the crowd will boo him even if he does turn. In short, what they should do is have Reigns win the match with help from Triple H and then have Reigns shake his hand and join The Authority post-match. Another option is have Lesnar return after the match, take on the winner and beat them for the title. You never know! I can’t see a scenario playing out that has any other semi-finalist winning this tournament. Reigns will win one way or another which is fine so long as they give us a reason to be invested in him. That’s going to be very hard to do as a babyface, but as a heel the door is wide open.